Roll your warp yarn into a ball. Tie one end on the top of the frame of the loom. 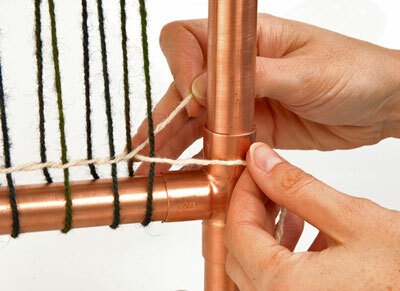 Wind the warp around the frame of the loom. Keep the warp firm and even. 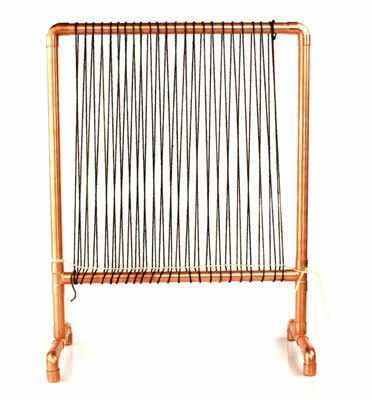 You will have threads on both the front and back of the loom. You can bring both of these sets of threads together with a weaving technique called twining. Fold the cotton yarn in half. Loop the yarn around the frame just above the bottom bar. Pull it tight. Twine the cotton yarn through the warp by taking one warp thread from the front, slipping it between the pair of cotton yarns, twisting the cotton yarns together, and picking up the back thread. Slip the back thread between the pair of cotton yarns. Give the cotton yarns a twist. Continue picking up one warp thread from the back and one from the front all the way across the warp. This cotton thread is taken out when you finish weaving. This warp is perfect for thick, handspun yarn. When you are weaving, you should pack the handspun tight with a tapestry beater or a kitchen fork. This ensures that the handspun covers the warp.